Deep Steep's Body Butter is just the ticket for ultimate hydration. It's specially formulated to restore moisture to skin in need of intensive repair. 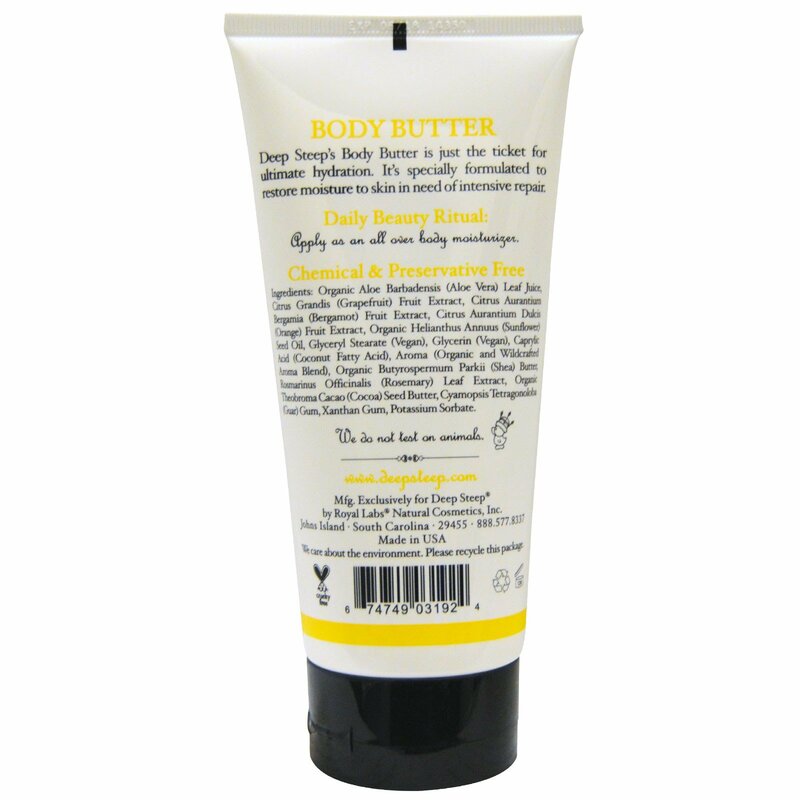 Daily Beauty Ritual:Apply as an all over body moisturizer. Organic aloe barbadensis (aloe vera) leaf juice, citrus grandis (grapefruit) fruit extract, citrus aurantium bergamia (bergamot) fruit extract, citrus aurantium dulcis (orange) fruit extract, organic helianthus annuus (sunflower) seed oil, glyceryl stearate (vegan), glycerin (vegan), caprylic acid (coconut fatty acid), aroma (organic and wildcrafted aroma blend), organic butyrospermum parkii (shea) butter, rosmarinus officinalis (rosemary) leaf extract, organic theobroma cacao (cocoa) seed butter, cyamopsis tetragonoloba (guar) gum, xanthan gum, potassium sorbate.